It's hard to fathom, but America's Soul Live at the Olde Town Pickin' Parlor in Arvada is on the eve of its 15th anniversary. On Tuesday, March 19, we'll present a special anniversary show. I'll be joined by so many of the great musicians who have made the show so special over the years. Dubbed DOG DAYS, the band will feature yours truly on guitar, harmonica and vocals, Ernie Martinez on everything with strings, Johnny Neill on fiddle, Dana Vernon on acoustic guitar, electric guitar and bass, John Macy on pedal steel guitar and Chris Stongle on drums. We'll be performing songs that have meant a lot to the show over the years, along with new Chandler "stuff." Sweet hors d'oeuvres and vino (both real and fake) will be served at the break in honor of this great celebration. Hope to see you at the Pickin' Parlor on the 19th and, as always, reservations are strongly suggested. Celeste Krenz and Liz Barnez perform at the Olde Town Pickin’ Parlor, in Historic Olde Town Arvada. Tickets are $15, and the show begins at 7:30 pm! Acoustic folk and jug band legend Jim Kweskin performs at Olde Town Pickn Parlor on Saturday, March 16! Celeste Krenz & Liz Barnez! Great live music with two wonderful and talented humans. Sally Barris and Rebecca Folsom will be performing in our store, with special guest, Leann Roberts. Ring in the season with songs to warm and uplift the spirit. 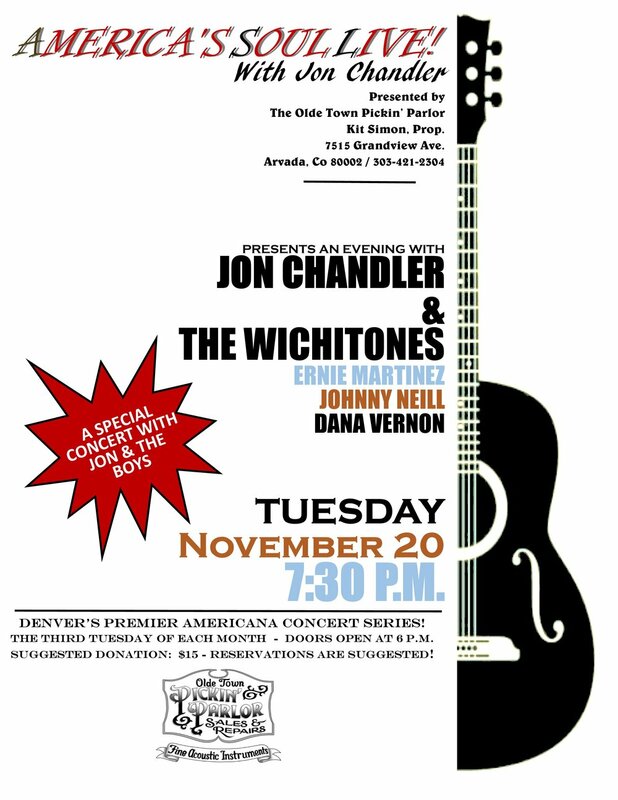 America's Soul Live at the Olde Town Pickin' Parlor presents Jon Chandler & the Wichitones in concert on Tuesday, November 20. Once each year, we forgo having monthly guests, and concentrate on presenting an in-house concert that approximates what we do at concert venues, gatherings, and festivals. We'll be performing favorite songs, brand new songs, and special tunes from each of the Wichitones (Ernie, Johnny and Dana). Lots and lots of fun, folks. It'll be a night of superb picking in front of the best small audience in existence. America's Soul Live with Jon Chandler. The third Tuesday of each month at the Olde Town Pickin' Parlor in Arvada, CO. Hope to see you there! We're getting ready to host what promises to be one of the most entertaining America's Soul Live shows in our nearly 15-year run. I think Rebecca Folsom and Mary Huckins are two of the finest singer-songwriters on the planet, and have been in love with their work for years. Rebecca calls Boulder home, and is a genuine troubadour, travelling the country bringing her incredible voice, songs and stage presence to folks everywhere. Evergreen-based Mary is the "blonde" in Dakota Blonde, whose crystalline vocals and infectious songs have garnered legions of fans across the country. Ernie, Johnny and I are delighted to have our favorite songbirds together with us again on the Pickin' Parlor stage. Make sure to call for reservations...they're highly suggested. Hope to see you next week! All the info's on the flyer. Grammy nominated mandolinist, Matt Flinner, will be joined by fiddle legend Blaine Sprouse, for an evening featuring a mix of Bluegrass and Newgrass. The show will be at the Olde Town Pickin' Parlor, in historic Olde Town Arvada. The evening will kick of with some music from Ross Martin and Eric Thorin. Tickets are $15. Olde Town Pickin' Parlor will have a booth in the vendor's tent at this year's 2018 Rocky Grass festival. OTPP be will joined by the one and only Paul Beard, of Beard Guitars. Paul will be available to look at Beard owners’ guitar’s for any needed set-ups. 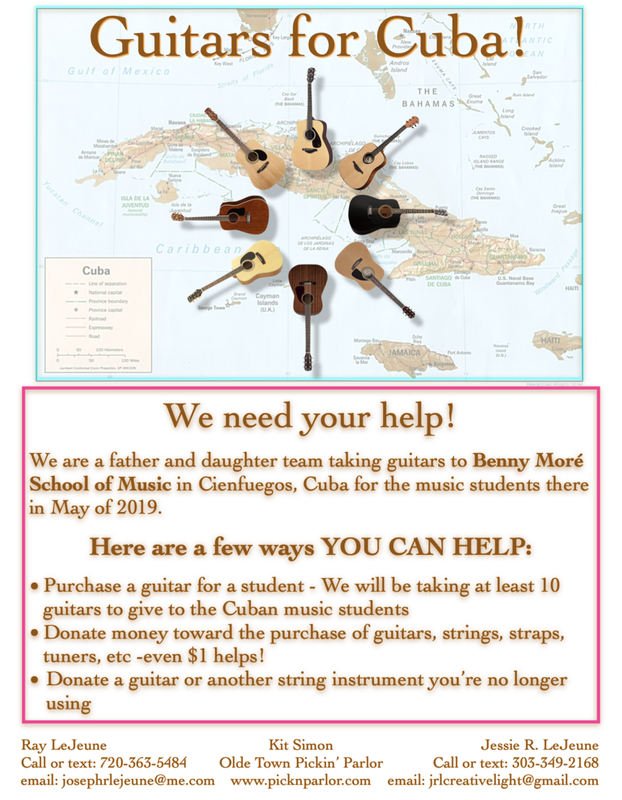 A variety of Beard Guitars will be on hand, and we are sure that many jam sessions will occur! 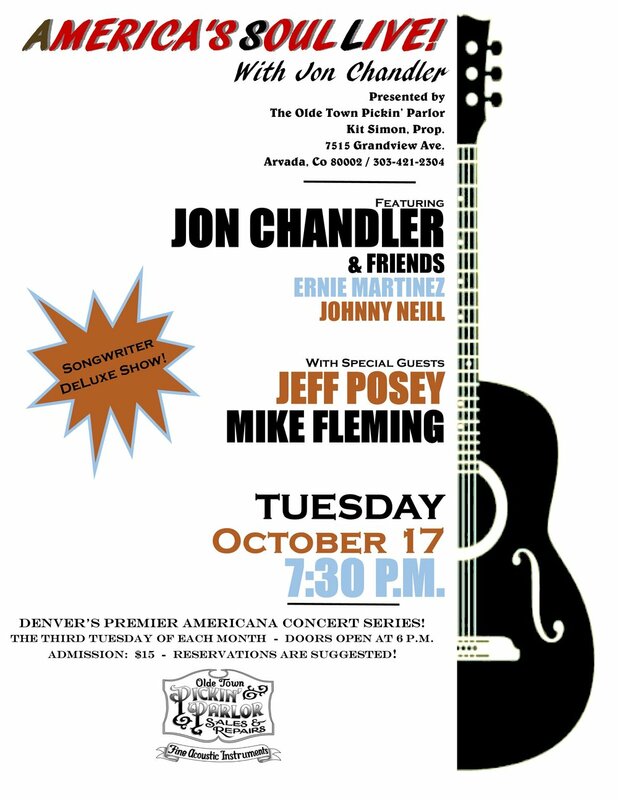 America’s Soul Live with Jon Chandler at the Olde Town Pickin’ Parlor, 7915 Grandview Avenue, Arvada, CO. (303-421-2304.) This ASL will be one of the year’s best, with audience favorites Mike Blakely and Juni Fisher joining Jon, Ernie & Johnny. Two of my absolute favorite singer/songwriters and friends will drop into the Pickin' Parlor during their July tours for the third straight year. As always, reservations are strongly suggested. We’re thrilled to invite two first-time guests to America’s Soul Live at the Olde Town Pickin’ Parlor on Tuesday, May 15. Randy Chavez is an integral part of Denver’s vibrant music scene and Mark Cormican is busy making his mark on Colorado after a long career in the South. Randy is a fixture in Colorado recording studios and took the stages of dozens of important Colorado and national venues (including Red Rocks six times!) as the guitarist for the iconic Denver band, Opie Gone Bad. A stellar musician, he has backed national performers since his teens including everyone from Bob Hope to Ella Fitzgerald, and even comedian Andy Kaufman. He has performed with the Colorado Symphony Orchestra for 20 years, accompanying guest artists ranging from Steve Vai to Bela Fleck. Although Randy is known for his work in virtually every variety of rock as well as classical music, his newest project, One Good Vice, teams him with songwriter and singer Greg Hartley in a progressive country vein that showcases amazing versatility. It’s a real treat to welcome Randy and Greg to the Pickin’ Parlor Stage. Mark Cormican is a Kentucky transplant busy making Colorado his home. As part of that transition, he has hooked up with a host of the state’s best musicians (including Ernie Martinez and Johnny Neill) to produce his impressive new release, Family Tree, a collection of original songs that showcase his affection for traditional country, folk and Americana music. An exceptional country songwriter and great singer, Mark is also a devotee of John Denver, and performs a tribute show throughout the country featuring many of Denver’s classic songs. Welcome to ASL, Mark! This will be an incredible show, so call Uncle Kit to make your reservations, and we’ll see you at the Parlor! Admission is $20. Doors open at 7 p.m.
We have an incredible America’s Soul Live in the works for Tuesday, October 17, featuring Texas singer/songwriter extraordinaire Jeff “Wildhorse” Posey, and California-based (but Colorado raised) acoustic music master Mike Fleming. Jeff is a two-time Kerrville New Folk Finalist and a two-time Spur Award Finalist, which translates into the highest praise for a Country and Americana singer and songwriter. He’s written and performed with Texas legends Mike Blakely and John M. Greenberg, and we’re delighted to welcome him to the Pickin’ Parlor Stage. Mike Fleming is one of America’s premier songwriters and song interpreters, period. We’re lucky that he’s touring with his trio, New West, and will be able to spend a couple of extra days in his native Colorado to join us for his second ASL appearance. Two powerhouse performers, plus Jon & the Boys. A wonderful ASL is in store. As always, reservations are suggested. 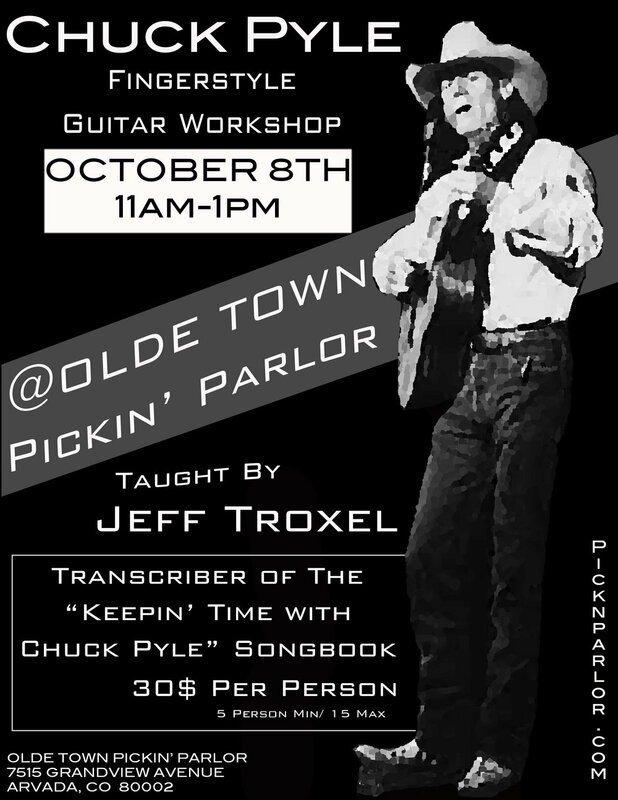 Looking forward to seeing you on Tuesday at the Olde Town Pickin’ Parlor……. A very special America’s Soul Live on Tuesday, September 19 with songwriting powerhouses Buddy Mondlock and Templeton Thompson joining Jon and the boys. Buddy’s written for a who’s who of country and Americana artists including Guy Clark, Nancy Griffith and Janis Ian, and is widely considered one of acoustic music’s very best singer/songwriters. It’s a treat to welcome him back to the Pickin’ Parlor Stage. Templeton Thompson joins us for the first time from her Nashville home, where she’s not only an in-demand songwriter (Reba McEntire, Jo Dee Messina, Little Texas) and performer, but a world-class equestrian, as well. She’s joined by her equally talented husband, singer/songwriter Sam Gay. All the info's below.